Hey friendz! The calendar has changed once again and it's 2012. This year, TheHolidaySpot provides you with the fabulous opportunity to make your own calendar and send it to your dear ones. How, are you thinking? Simple! 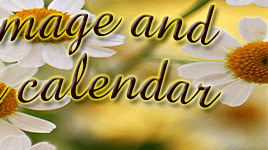 Scroll down and upload any image of your choice; select the calendar month of your preference with the alignment of your liking. Then pass it on to the person(s) you like. Enjoy 2012 with one and all. Tip: Click on the "browse" button to upload here any image you have saved in your computer. Then select the calendar month you wanna send; pick the alignment of your choice - TOP, DOWN, RIGHT or LEFT. Then click on "Done" and you'll get a preview of your image along with the calendar month of your preference. Send it to your friends via e-mail. To issue a printout, click on "Print" . To make some modifications, click on "Edit" and do the same.